entire hard disk. Through the use of backup operation, users expect to retain their state of preservation of the files, whole hard disk or partitions, and then through the restore operation, the saved state of the files, partitions or entire hard disk can be zoning restored to its state of preservation at the prior time point. Snapshot can be scheduled to quickly restore to the preserved system state. EaseUS Todo Backup also allows users to clone a hard disk, in order to replace the old one or transfer to another one. Focusing on efficient and stable backup, EaseUS Todo Backup is dedicated to safeguarding the operating system, emails, disks, partitions, documents, photos, pictures and musics, etc. 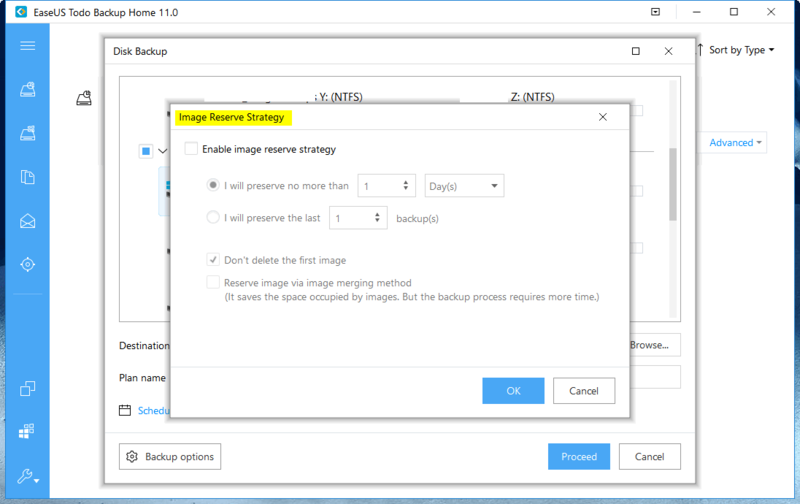 EaseUS Todo Backup generates the .pbd images for your reliable backups, which are to be promptly and easily recovered in the case of system crash, partition/disk corruption, virus infection and unexpected data loss, etc. Being distinguished from OEM backup solutions, NO extra hidden partitions are to be created or required on your hard drive to get EaseUS Todo Backup perform a backup or restore. Fast and efficient full, incremental & differential backup application to create the image of your disk/partitions and your important files. One-click system & recovery solution. Easy one step feature to perform system backup & recovery or full back up operating system, hard drive, partition, files & folders and applications, and instantly recover all to ensure business continuity. One-click to recover system feature to dissimilar hardware configuration for hardware replacement. Exchange/SQL Exchange/Server database backup & recovery solution. Fast and reliable backup and disaster recovery solution to full protect your Exchange/SQL Server database. Backs up email in Outlook and save them in a safe way offering ease of access accidental deletion of email occurs. Copy to cloud (backup to Cloud Directory folder) which synchronously store backup images to Google Drive, SkyDrive, Dropbox for double protection of data. Scheduled backup features which allows to automatically perform backup tasks according to scheduled time or events. Clone Drive feature which allow duplicating one hard disk to another. Saves time by eliminating the need to re-install the operating system, drivers and applications. EaseUS Todo Backup can make copies of data so that these copies can be used to restore to the original state in case of computer disaster or any unexpected troubles. Giving the user easy back up of whole disk or the partitions and files to an image. For disk/partitions backup, not only the data partitions can be backed up, but also the system partition. The user can perform the operations directly under Windows, while other applications in the disk/partitions are still running. For file backup, this product can keep all information related to files, including file content, file name, file attribute and even the folder structure. And an important feature in EaseUS Todo Backup is the ability to make partition and file incremental backup. Once you create a full backup of the partitions or files, the user only need to image changed data during an incremental backup. This process is much faster than image all files once again. As Windows Operation System is critically important, protection of the main OS in case of system crash is the main concern. EaseUS Todo Backup provides the easiest way for system protection with System Backup. As the necessary partitions for system boot will be selected as the backup target here automatically. The user just needs to perfect the Destination, Plan name and Description. Advanced backup settings are useful when you want to create a flexible and automatic backup plan. Schedule feature is available to create an automatic backup plan as well as backup options to edit the advanced parameters. An "Image-reserve strategy" is provided to reserve the limited image as per image retention rule. Suppose there is only one disk with more one partitions on your computer. System Backup is to back up the partition only where the system and boot partitions are saved. In this case, the user should use Disk/Partition Backup to cater to back up the rest of the data partition or when there are more than one OS partition (in the case of dula-boot). Large amount of vital data needs to be protected as time goes on, such as documents, pictures, musics and videos, etc. It is a sound practice to backup these important files on regular basis. File Backup is provided for this scenario. If the user justs want to backup one or some specific file types from one folder, the option at top right corner (Only back up the selected file types) can exclude the others files. Smart Backup was added in EaseUS Todo Backup from version 7.0. This feature performs a scheduled backup every half an hour provided any changes are made in Smart Backup. Take note that Smart Backup does not support disk or partition backup. Files/folders saved in network drive is not supported by Smart Backup. 3. Want to create multiple backup points for the recovery or rollback. Microsoft Outlook being the most popular email application used by all, EaseUS EaseUS Todo Backup provides features to backup important mails, save them in a safe way then offering ease of access accidental deletion of occurs or if needed, help the user backup un-read emails and provides a way to make him read it later or at the leisure of the user by opening the bakup file via explorer. Take note that during Mail Recovery the existing emails/contacts will not be overwritten. In another word, it is a filling-up restore in the process of mail recovery. Cloud backup supports File backup, Smart backup, Mail backup and Exchange backup only. Supported Cloud Storage includes OneDrive, DropBox and GoogleDrive. Scheduled backup runs automatically in a regular time interval or at a specified time point. Set a specific time point to execute the backup once. Execute backup in date period - Set start date and expire date for the plan. Execute backup every X day(s) at the specific time point. Or execute backup every X day(s) and every X hour(s)/minutes(s) from start time to expire time. Suppose start time is at 6:00 am and finish time at 10:00 am with 2-hour interval time. Backups will be executed for three time at different time points, 6:00 am, 8:00 am and 10:00 am. Execute backup every X week(s) on the specific day(s) at the specific time point. Or execute backup every X week(s) on the specific day(s) and every X hour(s)/minutes(s) from start time to expire time. from start time to expire time on specific day(s) in specific month(s). System startup - Backup runs automatically when system starts up. System shutdown - Backup runs automatically when system is shutdown. User log on - Backup runs automatically when Windows logs in. User log off - Backup runs automatically when Windows logs off. provided that it is set to be the destination. Destination storage is to be out of space soon or later without Image Reserve Strategy. Images are be deleted on the basis of period, numbers, week, month and year. Don’t delete the first image - First full image will neither be deleted nor be counted into preserved images as per image retention rule with Don’t delete the first image checked. Reserve image via image merging method - Images are to be intelligently merged with Reserve image via image merging method checked. For more details, please click here. Recovery is the reverse process of a backup. It will expand the files compressed in the backup image and restore files to the time point when the image file was created. With a simple recovery process, the user can rescue/recover the computer from a variety of disasters, such as virus infection, system crashes, partition failure and data loss. The user can get your computer back to a healthy state As long as you have an image file which is a backup of your healthy computer, then all the troubles can be removed easily. There are two functions in this page, (1) File recovery and (2) Disk and partition recovery. The user can choose the corresponding recovery method according to a requirement. 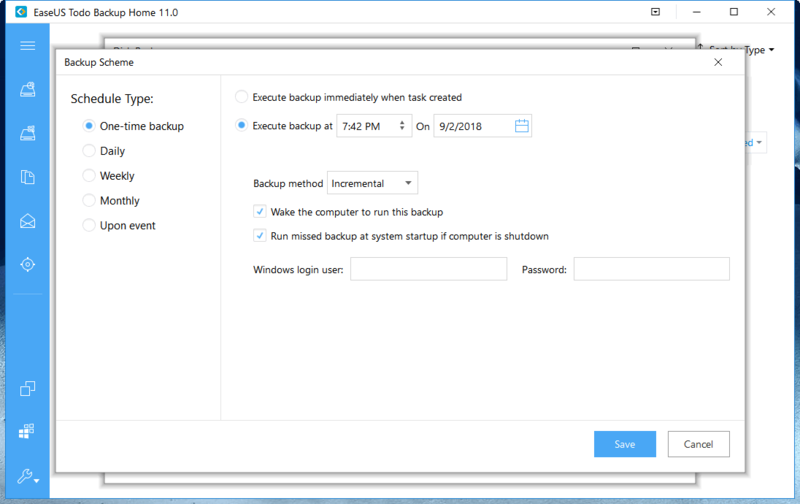 EaseUS Todo backup has advanced settings that can help you restore the backups more stably and smoothly in some special case. However, without these advanced settings, EaseUS Todo backup can still give you a full restoration. Sector by Sector recovery - Checking this option will recover the contents from an image file sector by sector. It ensures that the recovery process finishes successfully even if there are some logic errors on the original partition or hard disk. If you want every file distributed to its original sector after recovery, checking this option will meet that goal. A System Backup plan has Recovery, Backup and Advanced buttons. A Disk/Partition Backup plan has similar Recovery, Backup and Advanced buttons. The user just needs to directly click the Recovery button to restore the backup created beforehand. Select one History version of backup image, after confirming the contents, click Next button and select target location to restore. The two options are available for System and File Disk/Partition backup image. You can restore individual files from the disk/partition image flexibly. Restore the entire disk/partition image. Recover individual file/folder(s) from Disk/Partition backup image. Sometimes, If the backup plans lost due to re-install EaseUS Todo Backup, and you cannot find the plan record in Home page. Or you try to restore under WinPE emergency disk. Then the Browse to recover option is necessary. EaseUS image files can be directly accessed. You can double click on the .PBD image file or right click it and choose open to browse it. Find the target file, right click it to display the menu, and then open, copy and recover specified files in the image. Since most hardware requires corresponding driver installed to be functional, users cannot simply move system to a new machine with different hardware configuration and expect the system to run as original due to lack of necessary hardware driver. EaseUS Todo Backup provides System Transfer feature which can help users solve the trouble easily. 1. Migrate system to a new and more powerful PC. 2. Restore and keep old system available after some hardware upgraded. 1. A valid system image file created with System backup or Disk/partition backup option. 2. A proper WinPE emergency disk/USB which can be loaded on target machine correctly. 3. The inf driver file of the new hardware on target machine. 1. Load target machine from the WinPE emergency disk and ensure the drive which contains system image files has connected to the machine already. 2. Find the option System Transfer in the main window. 3. Browse and load the system image file. 4. Select the target drive to restore. 5. Confirm the effect if restoration completes. 6. After system recovery finishes, you may get some prompted windows asking for driver (.inf file) of a specific hardware. You can find the driver according to the listed hardware info, and add it to ensure you can load from the system normally after the entire system migration is done. This function allows you to make a duplicate of the selected hard disk or partition. Compared with backup task, there will be a duplication hard disk or partition generated instead of generating an image file after the operation. And you can directly use the duplication without recovery task. Clone Drive duplicates one hard disk to another. It eliminates the need to re-install the operating system, drivers and applications, and enables you to upgrade a new hard drive with only a few mouse clicks. For a successful copy process, please make sure the capacity of destination hard disk is equal or larger than the used space on source hard disk. It’s a common job to replace the hard drive where Windows exists. This may be resulted from a failing drive or requirement for larger disk capacity. Disk Clone option in EaseUS Todo Backup can deal with the job easily. Disk clone will transfer all data (include operating system and program) on the selected hard disk to another. It is especially useful when you want to replace hard disk with a new one. For a successful disk clone, please ensure that the capacity of destination disk is larger than the used space of source disk. Note: System Clone is not available for use under the condition that your system partition and boot partition are not on the same drive. EaseUS Todo Backup Home provides tools that can make your backup/recovery process more efficient and flexible. Check image can verify the validity of an image file. If errors are seen during checking process (signifying corruption or damage) then the image file might be damaged and cannot be used for recovery. So it is a must to check the image regulary. EaseUS Todo Backup allows users to create an emergency USB disk or CD/DVD. This is the most indispensable tool to be used when windows system fails to boot. This feature allows the user to permanently erase data on the disk(s) or partition(s). The user can set Erase Times to wipe data. Pre-OS can be considered as an alternative of WinPE bootable disk. It can also help the user in recovering the system when unexpected failure occurs. Switch the status of Pre-OS between Enable and Disable. The name of the button depends on the current status of Pre-OS. If Pre-OS is currently enabled, the button will be Disable Pre-OS. Once the Pre-OS enabled, user will get a EaseUS boot menu when computer boots. Connect and configure the iSCSI device. Once connected, you can backup and restore the iSCSI drive like local hard drive. In order to browse/confirm the files and folders in a disk/partition image or system image ( *.PBD file), we provide the mount function. Users can directly copy needed files from the mounted drive without restoring entire image. Mount function is a good way to check whether the created image is valid or not. Disk/Volume backup and System backup image are supported only. A password is necessary for encrypted backup image. To fully access mounted virtual partition, please make sure the image is created and mounted in same Windows account. Mounted drive will automatically disappear after computer restarts. Refresh Disk is used to load the latest status of local hard drives after a disk is updated or newly added a new disk. It is also necessary to use this option after adding driver file of a disk in WinPE. Fix: Failed to clone GPT system disk sector by sector. Fix: Cannot re-create WinPE bootable disk when the creation fails. Fix: Cannot recover to network in some cases. Fix: Some incorrect error messages. How to Backup and Restore Disk/Partition Data? three (3) licenses of EaseUS Todo Backup Home (latest version) for our members. "WHAT is your current backup software application and WHY do you want to win a license of EaseUS Todo Backup Home?" Optional: Please like/follow EaseUS's social networking sites as added support. Do wygrania znany i ceniony program do tworzenia kopii zapasowych EaseUS Todo Backup Home.Konkurs zaczyna się 19 października a kończy 15 listopada, do wygrania 3 licencje. 1.Napisz jakiego programu do tworzenia kopii używasz i dlaczego chcesz wygrać EaseUS Todo Backup Home. Losowanie odbędzie się za pomocą strony random.org, zwyciężcy będą mieli 3 dni na potwierdzenie wygranej, czyli musicie wysłać prywatną wiadomość do @jasonX w której musi znaleźć się imię oraz adres e-mail. I am using Macrium Reflect Free + Aomei Backupper Standard at the moment. Although I can rely on bth most of the time any sane individual needs to have more than 1 Pro backup software so as when you encounter any issues recovering you can just switch to another backup done from the alternative. I have had issues when I needed a backup and BOOM it cant be recovered or used properly so I need a different backup application that I can use as backup to my existing backup application. I am currently using easeus home free version. I Like the idea of differential or incremental Backups ,and being able to schedule the time when BU runs. I love the set up program and just forget it, A back up is always available and current. backup contest because according to the given description it is better than macrium, and it is best to check it in use. For backup now I use Backup4All Lite program and want to win EaseUS Todo Backup Home license because This program has more functionality to backup and restore all kinds of data, it is a simple and convenient program to create backups of the operating system, a separate partition, folders or individual files. Bardzo dziękuję za zorganizowanie tego konkursu. Dotychczas kopie zapasowe były robione automatycznie przez system. Dodatkowo dziś zrobiłam kopię zapasową za pomocą polecanego tu EaseUS Todo Backup Home 8.8, zamierzam za jego pomocą robić kolejne backupy, chyba że uda mi się wygrać nowszą wersję tego przydatnego programu. Czyli kopie zapasowe robię za pomocą systemu, oraz EaseUS Todo Backup Home 8.8 i chciałabym wygrać jego nowszą wersję, bo na pewno zawiera więcej przydatnych opcji, niż jego wersja, której używam obecnie. OK, I write also in English: thank you very much for organizing this contest. So far backups was created atomically by the System. Additionally today I created backup using the software recommended here: EaseUS Todo Bakcup Home 8.8, and I want to still use this software to create next backups, unless I win newer version of this useful software. I'm doing backups using the System and with EaseUS Todo Backup Home 8.8, and I want to win it newer version, because for sure it contains more useful functions than version that I'm currently using. I am now using Macrium Reflect Free version and do my manual backup whenever required. EaseUS Todo Backup Home an allow users to create an emergency USB disk or CD/DVD and backup email in Outlook offering a safe way to store my emails. It can also copy my files and folders to cloud for better storage and provide scheduled backup features. With these favorite features provided by the software, I am eager to win this license. Currently using AOMEI free backupper but appeciate the opportunity to try this instead! O, widzę że Konkurs przedłużony do 20 listopada 2018. Dziwnie mało chętnych, patrząc na ilość forumowiczów odwiedzających stronę (choć dużo tych samych). Pewnie mają dużo lepsze programy do backupów, albo ich nie robią wcale (ich problem - później). Ja używam EaseUS Todo Backup Home 10.6 ( z promocji). Sprawuje się bardzo dobrze. Nie jeden raz uratował mnie z opresji. Jak się załapuję w regulamin, to chętnie wygram.......jak los pozwoli. Bardzo chciał bym wygrać EaseUS Todo Backup. Słyszałem o tym programie bardzo pozytywne opinie wiec chciał bym przejść na EaseUS Todo Backup z Paragon Backup&Recovery. My current backup app is windows 7 built in system image backups. I want to win a license of this excellent program because it offers additional and extremely useful features such as disk cloning, Mail Backup / Recovery etc.